Following on from my earlier tests of browsers in Vista, I now present the Windows7 results. In case you were expecting things to fall the same way, you’d be surprised. The underpinnings of windows7 are different from those of Vista, and so browsers which are written to run at their best in one, may not work so well in the other, and so it turned out. As before the 5 main clients were tested on Feb 1 2012, using the latest versions available on that day. As with the vista test, the first three tests were run in sequence, and then the memory test was run on all the browsers simultaneously. The test hardware is different from the Vista unit, being an i3-based windows7 laptop with intel graphics. Specifications are listed on a past test. As noted already, the peacekeeper test has changed since the last time I performed these tests, in an attempt to make them more relevant. The final scores are here, but the raw scores are given at the end. The strangest thing here is that compared to the vista scores, some browsers barely moved at all, despite a more modern OS, and a faster processor. Part of that may be the graphics tests that suffered from the less capable Intel integrated GPU, but other browsers seemed to rise to the challenge just fine. 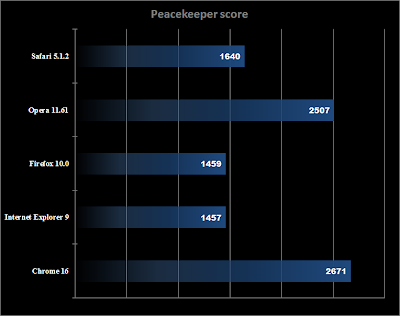 In particular, Firefox and Chrome had a movement of only a few dozen points, negatively for Firefox. Yet Opera, Safari and IE made huge gains over their Vista scores. 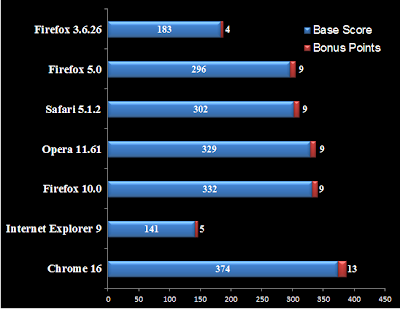 In fact, while Vista gave a spread, with Chrome in the lead, on Windows 7, it appeared to be 2 distinct groups – a lead group of Opera and Chrome, and a trailing group of IE and Firefox, with Safari making a breakout. In the breakdown of tests, it appears that despite chrome’s heavy lead, still, in Data processing, in other areas, it’s starting to be surpassed. In addition, it’s Chrome’s the only browser to support all the video formats, and WebGL, and if Opera and Firefox get their missing codecs supported, we could see Chrome beaten. The results are certainly getting closer. 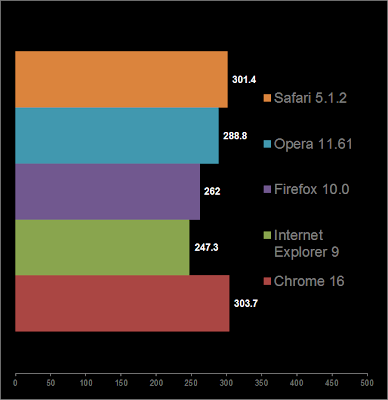 Firefox has increased its speed, closing in on Internet Explorer. Chrome is, again, the slowest, just being pipped by Safari. Using the tests from html5tests.com, all browsers picked up some points, except IE9. Surprisingly, that also includes FireFox5, which gained 10 points from its last test back in the summer despite the browser being completely untouched. I can only attribute that to the test being altered to conform to the new html5 specs. While only Chrome managed to break the 300 point mark last time, this time all except IE9 and the older Firefox’s made it. Opera is where Chrome was, while firefox has just nudged ahead for once. Chrome is way off in the distance though as we can see here. NOTE – these results were identical to the Vista results. Gmail, logged in but Gtalk turned off. A 10 minute 720p youtube video (http://www.youtube.com/watch?v=FicK4gP7kNc) played for the first 10 seconds, and the rest left to buffer. This gave a balance of data-heavy pages, and active content pages. Browsers were run simultainiously, to ensure they all had the same content. 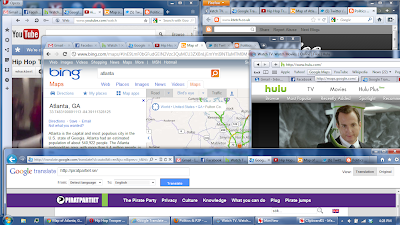 Each browser had the first tab set up, and then every browser had the second, with all actions being the same. 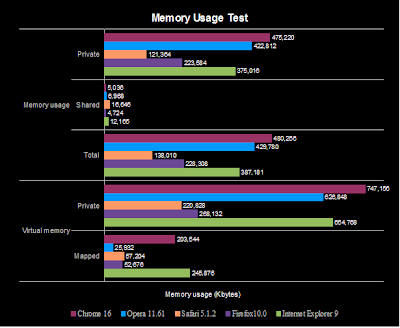 The figures were collected from Chrome’s memory manager, but were checked (which is one reason this took a week to get out) using figures from Process Explorer. It’s pretty much the same story as for Vista, with one exception. Chrome dropped from 3rd place to 5th. Windows7 is DEFINITELY not Chrome’s strength, like Vista. Another difference is that the laptop had less ram than the desktop used for the Vista test (4gb of DDR3 as opposed to 6gb of DDR2) which may have been a factor. 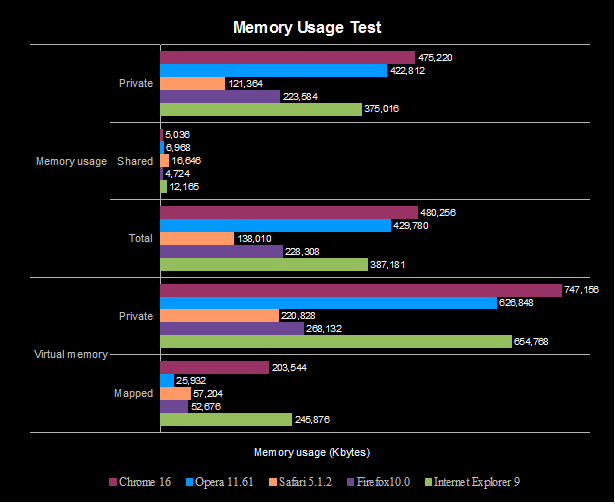 Also, while Safari had, again, the lowest usage, it also became unresponsive for 20-30 second periods during the test. 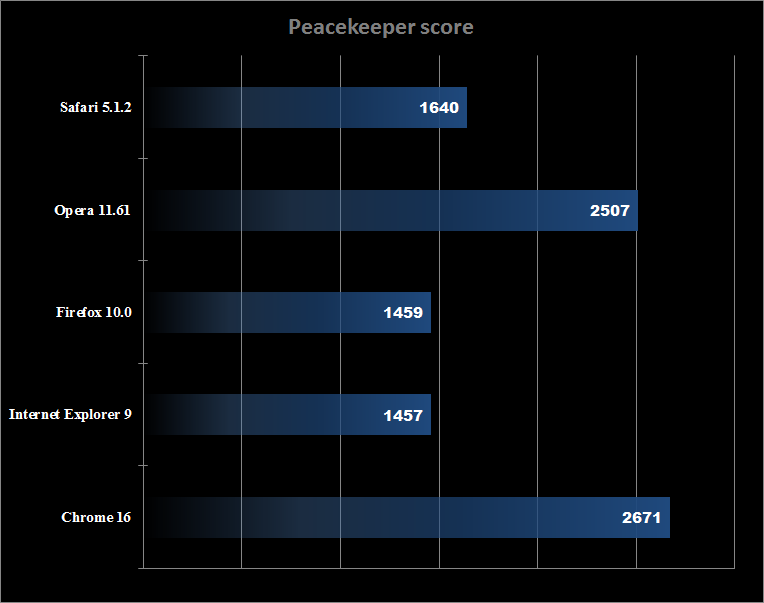 So, which is the best browser for Windows7 at present? It’s basically, again, between Chrome and Opera. If you want a feature-rich client, and can stand a few foibles (background tab opening locations, and having to click an extra time to start things like flash windows) it may be for you. However, it also behaves oddly with Facebook at times, and many sites that are strict on their requirements will tell you that you need to upgrade to IE7, or firefox2 to continue. Chrome on the other hand, is fast, but system-hungry, and doesn’t come with a whole lot of features built in. Yes, it does support more HTML5 features than any other, by a long way in some cases, and it’s integration with some Google services is nice (if you use them), as is the inbuilt translation, BUT it can be a bit unstable at times, and that’s never good. Safari is competent and slowly improving, but the three ahead of it are improving FASTER. Windows may be a secondary market for Apple, but it’s a major one, especially if people are going to want to have cross-platform use, as you can already get with Opera and Firefox. The freezing during the memory tests was also worrying, as no other browser had any problems, or hiccups, and that penalized Safari badly. As for Internet Explorer, what was decent 11 months ago is starting to look a little long-in-the-tooth now, even despite its Sunspider score. While it’s certainly better than previous versions, Microsoft needs to update things more often, at least every 6 months. However, with Internet Explorer 10 already in development, albeit for Windows8, I doubt we will see much in the way of improvement for 9.